WASHINGTON — Multiple missiles were fired again from a Houthi-controlled region in Yemen targeting an American warship in the Red Sea, a U.S. admiral said Saturday. No hits were reported. Later, U.S. officials said the initial reports as described by Adm. John Richardson, the top Navy officer, were being reassessed, and they declined to provide full details of what happened. If confirmed, the missile launches would be the third attack in about a week targeting the destroyer USS Mason and other U.S. ships. 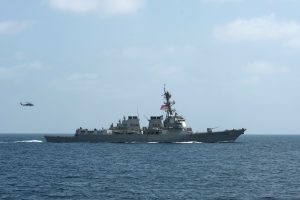 “The Mason once again appears to have come under attack in the Red Sea, again from coastal defense cruise missiles fired from the coast of Yemen,” Richardson, the chief of naval operations, told reporters Saturday in Baltimore. Just two days earlier, a U.S. warship fired Tomahawk missiles into Yemen to destroy three radar sites that Pentagon leaders believed played a role in the earlier attacks. A senior U.S. defense official said the Mason was in international waters when multiple incoming surface-to-surface missiles were reported by the ship’s crew to have been detected about 3:30 p.m. EDT. The Mason was not struck and no crew members were hurt. A U.S. official said that additional radars could have been used in Saturday’s reported attack. The officials were not authorized to discuss the incident publicly and spoke on condition of anonymity.